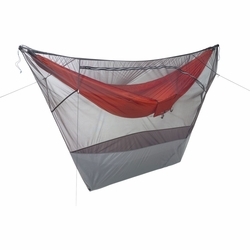 Therm-a-Rest Slacker Hammock Bug Cover. Kick back at camp in the height of bug season without a care in the world. The Slacker Bug Shelter simply clips into the Slacker Hammock’s suspension points and creates a safe haven from all things creepy and crawly. A large zippered entry makes getting in and out easy, an exposed webbing ridgeline offers a place for clipping lights or gear, and a PU-coated nylon bottom adds durability.